The Cascate delle Marmore are man made waterfalls originally created when the Romans decided to drain an unhealthy swamp by diverting the River Velina into the River Nera in the valley below. Today the water is used to power a hydroelectric plant and the falls are switched on and off – a little planning is required to see the falls in action, the times are published on the official website. The falls are 165m in height and the longest of the three drops is at the top, 83m in height. You can walk up a path beside the falls right to the top but be warned, you might will get wet at some of the viewing platforms so go on a hot day or take waterproof clothing. 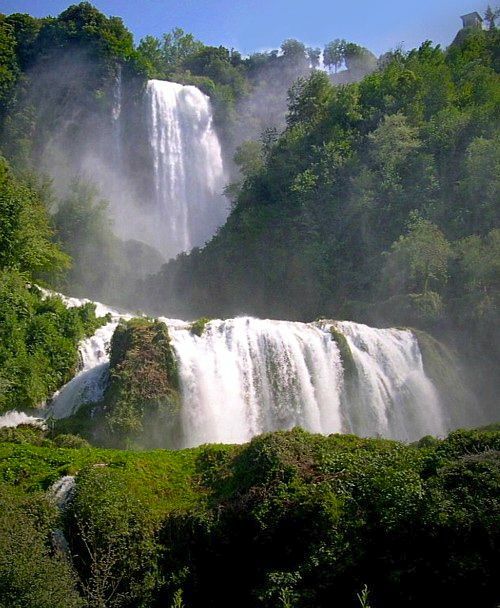 You can combine the Marmore waterfalls with a visit to the Roman Ruins of Carsulae.